ASP.NET 5 Middleware, Or Where Has My HttpModule Gone? ASP.NET 5 has been largely rewritten from the ground up, and incorporates some radical changes when compared with previous versions of ASP.NET. One of the biggest changes is in the HTTP Pipeline. This article looks at how those changes impact the design and registration of plug and play components that used to be represented by HttpModules. 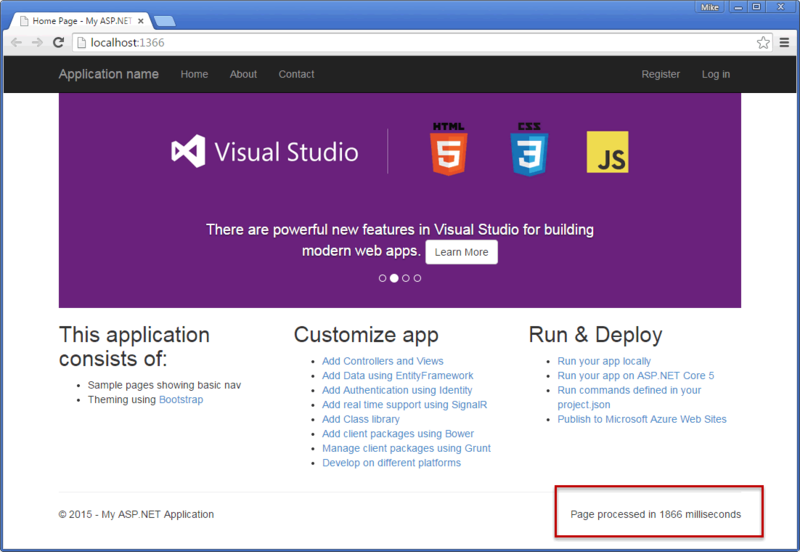 HttpModules act as request filters in ASP.NET versions prior to 5. They are reusable units of code that can be plugged into the request pipeline, and tasked with responding to events defined in the HttpApplication class as they are fired. The kind of things that modules are used for include managing authentication, global error handling and logging. Traditional forms authentication is implemented as a module, and I have written about using ELMAH, a component that logs details of unhandled exceptions, which is impemented as an HttpModule. Modules can also be used to intercept and modify the outbound response to remove white space or compress it, for example. Modules implement the IHttpModule interface, which is defined in System.Web, and that library is not part of the new ASP.NET. HttpModule code can either be added to the relevant event handler in Global.asax, or more usually, created as class libraries and registered with the application in the web.config file. Pass through components that form a pipeline between a server and application to inspect, route, or modify request and response messages for a specific purpose. That's also pretty much the description of traditional HttpModules and their kin, HttpHandlers. The methods by which Identity, MVC and static files management are added to the pipeline are extension methods on the IApplicationBuilder type. When adding the middleware that will be built in this article, I will also create an extension method for adding it to the pipeline. 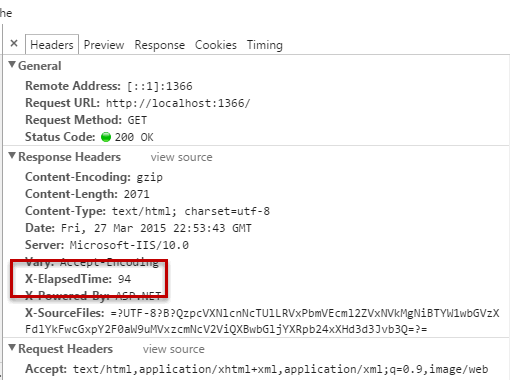 The HttpContext object is similar to the one found in previous versions of ASP.NET in that it provdes access to the request and response etc, but it is a different animal altogether and much, much slimmer. In ASP.NET 5, middleware is an instance of Func<RequestDelegate, RequestDelegate> - a delegate that takes a RequestDelegate as a parameter and returns a RequestDelegate. And as described above, the RequestDelegate is a function that returns a function, and it is in this way that the pipeline is built, with each piece of middleware being chained to the next and responsible for passing the processing on to the next in line (if appropriate). The Invoke method is a convention-based method in that the runtime looks for a method with that name and will call it. It is where the action happens within your middleware, and it is where you pass control on to the next component in the pipeline if appropriate. Sometimes you won't want to pass control on - you will want to halt execution of the pipeline altogether, if, for example, you are writing a custom authentication middleware that determines that the current user should proceed no further. Control is passed to the next component by calling await _next(context). Code that you place before this call is executed, and in this example that code creates a Stopwatch instance and starts it. The code also gets a reference to the response content, which is implemented as a stream. Then the next component is called, which in turn calls the next component and so on. Then control is passed back up the chain of components and any code that has been added after the await _next(context) call is executed. It is in that block of code in this example that the response body is modified to include some HTML to display the elapsed time in milliseconds somewhere in the footer region of the page. At the same time, a custom header is added with the elapsed time as its value. The result is a wrapper around the existing UseMiddleware<T> extension method (currently found in the Microsoft.AspNet.Builder namespace - hence the using directive) into something a little prettier. In this article, I introduced the ASP.NET5 replacement to traditional HttpModules and showed how to create one and plug it in to the application pipeline. This article is based on Beta 3 of ASP.NET 5 and the concepts illustrated here are subject to change. I will endeavour to keep the article current in line with future releases.